What’s new at Diamond Peak ski resort in Lake Tahoe? The resort recently announced some new features for the 2018-19 ski season. Diamond Peak is an intimate, family-friendly resort that has gorgeous views of nearby Lake Tahoe. Located in Incline Village, Nevada, the family-friendly ski resort offers 655 acres and 1,840 vertical feet of skiing and snowboarding, with incredible views of Lake Tahoe. Accessible from all areas of the mountain, the new Village Terrain Park location will allow park riders to explore more of the mountain before taking a lap through the park, or simply enjoy quick park-only laps via the Red Fox chairlift. The Village Terrain Park will take over what used to be the Penguin and Dusty’s Delight ski runs, as well as a portion of lower Wiggle, creating a comprehensive arena for Diamond Peak’s park staff to build features for all ability levels and conditions. Centralizing Diamond Peak’s terrain parks will also allow park staff to spend more time grooming and maintaining the features to ensure consistent conditions and maximum fun. Grading on School Yard beginner terrain: This summer, Diamond Peak was able to regrade the beginner-friendly School Yard run to make the terrain more welcoming to first-time and beginner skiers and snowboarders. Already known as one of the best runs for beginner skiers and snowboarders, the new and improved School Yard run will offer more usable space for beginners to practice their first turns without worrying about running into others around them. New season pass holder perks: Season passholders will enjoy 72 complimentary lift tickets at 18 partner resorts across the country this winter – up to four days at each resort. Participating include: Arizona Snowbowl (AZ), Beaver Mountain (UT), Beech Mountain (NC), Bogus Basin (ID), Boreal (Soda Springs, CA), Brundage Mountain (ID), Cooper (CO), Hesperus (CO), Homewood Mountain Resort (Lake Tahoe, CA), Lee Canyon (NV), Mission Ridge (WA), Mt. Ashland (OR), Pajarito (NM). Purgatory (CO), Red Lodge (MT), Sipapu (NM), Sirdal Skisenter (Norway), and Whitefish (MT). Every Diamond Peak pass holder also receives four discounted Bring-A-Friend Tickets they can use to bring friends to Diamond Peak. 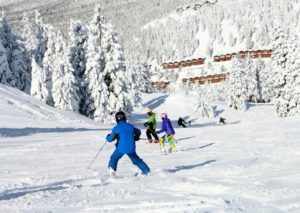 For more information or to check the snow report, visit www.DiamondPeak.com or call (775) 832–1177.